The first ROBOlympics, was held at Fort Mason’s Herbst Pavilion in San Francisco and featured hundreds of robots from around the world including fighting robots, sumo robots, maze-solving robots, androids that wrestle, do somersaults, and play soccer. Laughing Squid was one this year’s sponsors. 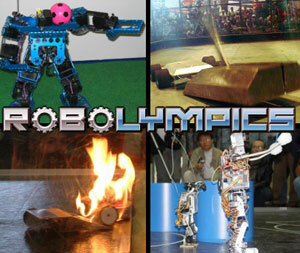 The inaugural Robot Olympics must be doing something right…they’re being sued by the US Olympic Committee. Here are some photos of ROBOlympics.